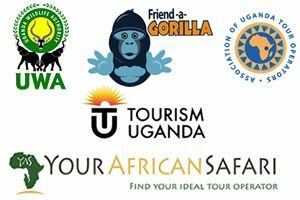 On this Gorillas & Serengeti safari you get the best of East Africa with gorilla trekking in Bwindi and game-drives in Serengeti. In Uganda you explore busy Kampala, go for gorilla trekking, boat-cruise to spot animals as well as chimps trekking and a visit by beautiful Lake Bunyonyi. Then in Tanzania you explore the vast Serengeti and Ngorongoro crater. Arrival at Entebbe Airport for the Gorillas & Serengeti safari, we meet our tour guide and transfer to our Hotel to rest after the flight. After breakfast you set off with your guide to explore the city. Depending on your interest you can visit the bustling city market, cathedrals, Kasubi tombs (burial site for Buganda kings), the Uganda museum or a crafts market. Depending on the day the evening could be spent seeing Ndere troupe local dance show. After breakfast start the transfer towards Kibale Forest National Park. Drive with our target to have lunch in Fort portal, a punctuation of stopovers at in the far country side offer us chances of stretching, tea plantations along the way as we check in late evening. Kibale forest is rich in primates and besides the chimps 9 other monkey species can be found here for example Black and white colobus – red colobus, red tailed monkey, grey cheeked mangabeys. In the forest area – colored aviation creatures-butterflies and various bird species like the native Great blue Turaco can be seen. We arrive at our overnight place with beautiful views of the forest. After breakfast get ready for the chimps trekking. Kibale Forest national park is a rainy forest and a home to over 1500 Chimpanzees and you can get close and capture shots of our closet cousins in the Jungle in there frenzy exciting moods grooming! After the trek we transfer to Queen Elizabeth national park. The transfer takes us through the beautiful crater areas. Pass by the Equator for the experience of standing with one foot on either side of it and poses. We have an eve targeting a fantastic sunset over the Rift valley. Explore Queen Elizabeth National Park in the cool morning, an early game drive that exposes us to diverse animals, big 5 members elephants, buffaloes, big cats- lions, leopards, warthogs and hunchback carnivals like hyenas are possibly spotted along the circuits as we drive along. There is a rich bird life especially our version of storks in the wetland sports as we reach the flamingos in the salt lakes. Back for lunch at the lodge and then head for the 3pm classic highlights of the 2hrs boat-cruise on the famous Kazinga channel, a 36km channel linking Lake George – Lake Edward. Here you can see land and water adapted hippopotamuses yawning and some slashing canines to each other and the National Geographical society killing machine the Nile crocodile gaping along the banks and savanna version of pigs the warthog- Pumba of the award winning Lion King are a hallmark sign in this animal home of Mamaland Uganda. Transfer to the Ishasha part of Queen Elizabeth National Park, famous for its tree-climbing lions. We will drive off in this adventurous vast savanna area with topis and the southern version of elephants to get the lions high in the fig-tree branches. After a game-drive of hopefully seeing the lions we continue on to Bwindi Impenetrable National Park, the home of the mountain gorillas. The journey takes us from flat savanna via cultivated hills to the forest covered mountains of Bwindi. Have an early breakfast and set off for the highlight of Gorilla trekking. 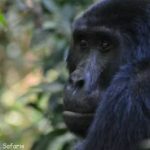 You head into the jungle with a specialized guide who leads you to the point where the gorillas are and you get to spend one unforgettable hour around them. Besides the gorillas this Impenetrable Forest is full of birds, butterflies and plant species plus forest hog, forest elephants, statungas and dikers. After the trekking transfer to Lake Bunyonyi, a lake 1840m above sea level with beautiful scenery. Start the day with a relaxed breakfast enjoying the beutiful lake. Then we start the journey towards Tanzania having lunch along the way to then cross the border and reach the town of Bukoba where we are to spend the night. This is a day to journey through Tanzania. Enjoy the countryside passing by the windows. We spend the night in Chatto. 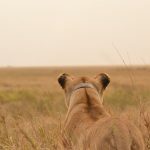 We continue our journey in Tanzania and by the end of the day we have reached close to Serengeti where we spend the night. Today we enter the Serengeti National Park from the less visited western gate, and you will marvel at the multitude of animal and bird life while journeying through this acacia-spotted savannah. Game sightings abound. We arrive at the in time to enjoy a respite from the dirt roads and heat of the day and enjoy a hearty lunch. 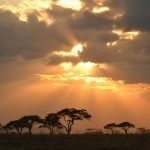 Later on in the afternoon, as the animal kingdom comes alive, continue your search for the “Big 5″ – lion, leopard, buffalo, elephant and rhino – while taking in the vastness of the Serengeti plains heading for the lodge as the sun sets on this magnificent animal kingdom. After an early rise spend the morning exploring the vast Serengeti and we move from location to location in search of sometimes elusive game and visit a waterhole known for its Hippos and alligators. Visit the Masai Kopjes, airstrip area and then back to the heart of Serengeti. After an easy early rise we head towards Ngorongoro Crater, cited as ‘Africa’s Eden’ and the ’8th Natural Wonder of the World’. The Ngorongoro Crater is a breathtaking natural wonder referred to as the world’s biggest wildlife zoo, due to its high density of resident game. In the afternoon we descend to the crater floor where you will be amazed by the sheer number and diversity of animals and birdlife. Standing in our pop up safari vehicle the viewing opportunities are endless, just deciding which way to look and what to look at, the choices are unlimited. The sheer excitement as we spot any of the big 5. Tonight as we relax we reflect on what has been a truly remarkable journey like no other experience and marvel in the wonders of the amazing wildlife East Africa has to offer. In the morning we make the drive to Arusha or Kilimanjaro where you are dropped off as we have reached the end of your safari adventure. Here you can plan to catch a flight on to other adventures or back to your home country full of memories to marvel over for a long time. Also take a look at our 11-days Uganda & Tanzania highlights safari.